If you have a hardwood floor in your home that’s looking a little tired then you can bring back its natural zing with a professional look refinishing. Even if you do maintain your floor regularly there will come a time when the shine is just a little duller than you’d like it to be, and normal wear and tear scuffs and scratches begin to appear. If this has happened to you then bring your hardwood floor back to sparkling life by treating it to a sanding and refinishing using our tried and tested techniques. If refinishing a hardwood floor is a project you have always wanted to get yothen it is best if you have at least some DIY and carpentry experience, or have someone to help you who does. 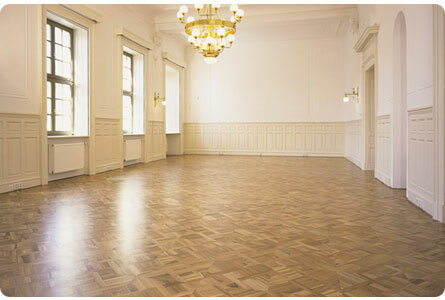 The first stage in any hardwood floor refinishing work is preparation for sanding. No prep time is ever wasted nor should it be skimped. Too often preparation that has been clumsily or hastily done will show up in the final finished effort as a supremely botched job! The first stage in the prep for sanding is to empty the room completely. This includes not only furnishings but skirting, fire surrounds, door panelling and dado rails. When the room is totally empty then sweep and lightly vacuum along the grain of the boards whilst looking out for any cracks in the wood, gaps between the boards or signs of rot. Any floor boards that show signs of rot must be replaced, and any other damage such as cracks should be repaired before starting the sanding process. Gaps between the boards should be filled with wood putty and all nails, tacks and staples removed or safely hammered in flush where they will cause no injury or damage. You will need a drum or belt sander to sand the boards and a smaller orbital hand sander for those hard to reach places, corners and stairs. If you are renting a sanding machine make sure you select both rough and fine sandpaper to use with the sander and apply the roughest grain on the initial sanding. The finer grain should be kept for the second pass when the boards are smoother. Always wear appropriate eye protection, ear defenders and a face mask at the relevant stages of hardwood floor refinishing and ensure there is sufficient ventilation in the room throughout the process. When you have fitted the paper into the sanding machine you ‘walk’ the machine along the length of the grain of the boards, stopping about 18 inches from the edge. (This is the area you will be sanding by hand.) Always keep the sanding machine in motion whilst it is switched on; if you leave it running stationary you run the risk of developing unsightly ruts in the boards which can be very costly to repair later on. 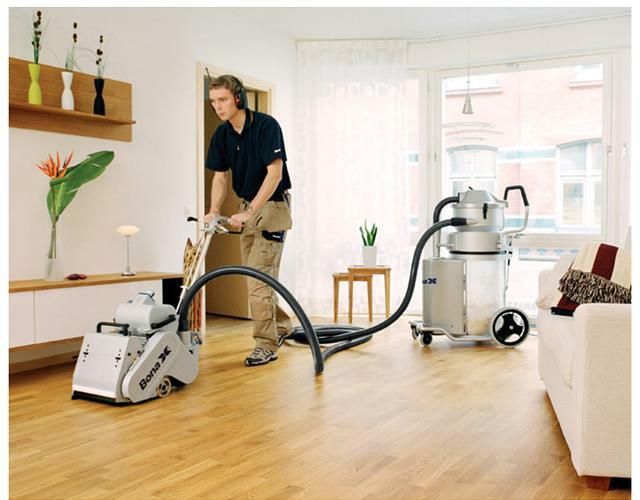 Once the whole sanding process is completed you should sweep and vacuum again but avoid any wet cleaning at this stage. When your floor is evenly sanded and uniformly smooth it is now time to move on to the refinishing. There are various options on offer, including wood stain, varnish, lacquer, floor paint or oil. Even though all modern finishing products on sale in the UK are now toxin-free, always be sure you have a healthy flow of fresh air whilst you are working. You would be wise to leave your topcoat to dry for 24 hours before reapplying and leave a further 48 hours before returning furniture to the room. Refinishing hardwood flooring, when done well, greatly enhances the look of any room as well as significantly adding value to your property.